The forecast for the Ladies Race was pretty dire with gusty winds and rain both threatened and as a result several boats pulled out of the event, concerned about racing borrowed boats in strong winds. Fortunately Georgina White in C4 Cormorant and Maddy Anderson in C55 Wind Sprite are made of stern stuff and were not going to be put off by the forecast. 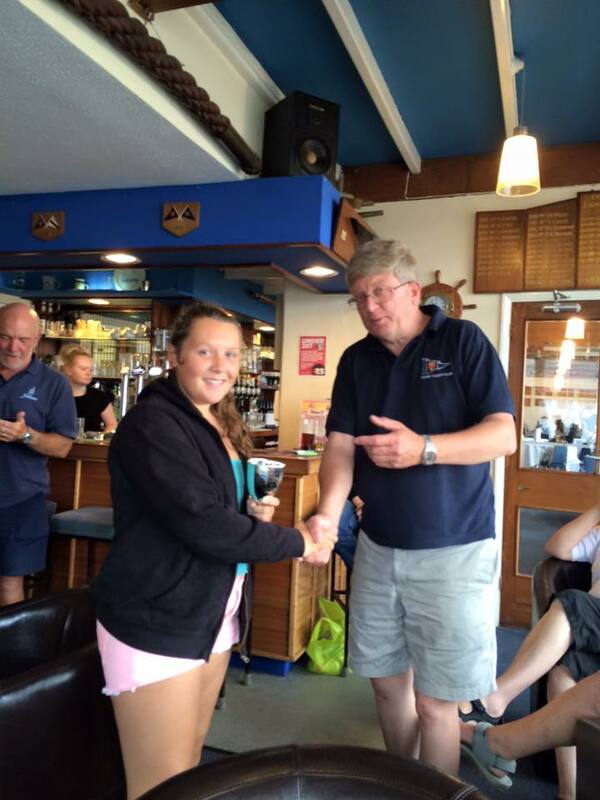 In fact Maddy was so determined to race that she stepped ashore from the Fastnet Race on Friday morning, travelled via a party in Southampton on Saturday night and arrived in Brightlingsea after a particularly tortuous journey north with only minutes to spare. After the forecast for strong winds the British weather did what it does best and provided exactly the opposite and Race Officer Nick Readings kindly postponed the start for a few minutes to allow Maddy time to get to the line as she was struggling against the tide out of the creek in light airs. Once underway the boats enjoyed a fantastic match race and the breeze did pick up, although the wind brought rain with it. But nothing could dampen their spirits and after a great short race around Big Buoy, Inner Fishery and Bateman’s before coming back to the line it was Georgina who was declared 2015 BOD Ladies Champion and Maddy the worthy runner up. Back in the club there was tea and cakes all round and Georgina was presented with the trophy by Nick.